​​The Uniformed Services Employment and Reemployment Rights Act (USERRA) is a federal law, passed in 1994, that protects military service members and veterans from employment discrimination on the basis of their service, and allows them to regain their civilian jobs following a period of uniformed service. USERRA applies to both public and private employers. The Office of Special Counsel, in conjunction with the Department of Labor, investigates and enforces USERRA claims involving federal government employers. The Department of Labor and the Department of Justice handle USERRA claims involving private employers as well as state and local governments. USERRA complaints must be filed with the Department of Labor, Veterans Employment and Training Service (DOL-VETS). 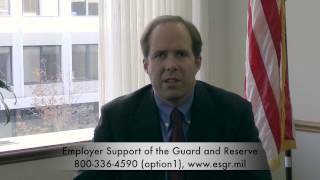 If you are considering filing a USERRA complaint or simply want to learn more, OSC recommends that you first contact the Employer Support of the Guard and Reserve (ESGR)​​. ESGR is an agency within the Department of Defense established expressly to help resolve these kinds of issues.